While many of his contemporaries preferred to be anchored to the green side and went to college in Taft, Ferdie and a few others wanted to know what life was like to be blue. So, he went to Ateneo – ‘the Ateneo’ if one is from there. Economics as a college program may not be selling like hotcakes these days; but a generation ago it was a ticket to a fancy career somewhere. In Ferdie’s case, however, the choice of Economics was something he had little to do with. It was never as though Economics was something that was rammed down his throat that he later wanted to regurgitate. On the contrary, Ferdie eventually came to love and appreciate the subject; enough, at any rate, to make him wish to pursue a post-graduate degree also in Economics. Armed with an Economics degree, it was inevitable that Ferdie would end up in the banking industry. As a banker, he has made the rounds of some very fine local and multi-national banks. 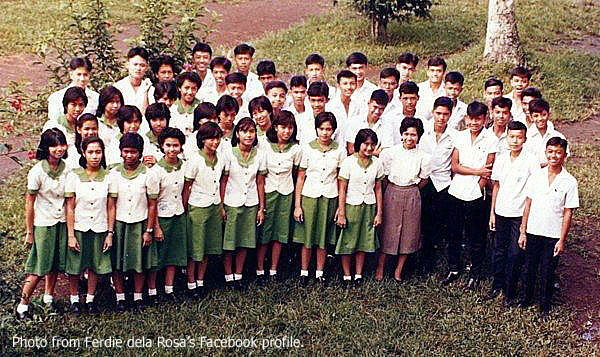 Fresh from college, he worked at the Far East Bank and Trust Company in 1988. He was Senior Credit Analyst and did the liquidity and solvency analysis of various corporate and retail accounts. In other words, he determined the ability of the bank’s clients to pay back their debts. 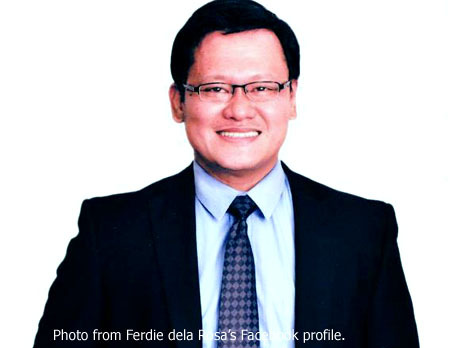 In 1994, Ferdie transferred to the First International Bank, where as Corporate Planning Officer he was responsible for conducting studies and based on these formulating the bank’s strategic moves. His stay with the bank lasted no more than a year, however. Ferdie’s next stop was the Equitable-PCI Bank, which he joined in 1997 and stayed with until 2002. He was the bank’s Credit Officer; and among his responsibilities were ensuring that credit policies and procedures were in accordance with established guidelines as well as keeping an eye on overdue accounts and making sure that collections were made. Ferdie worked with just one more bank prior to his current employment. With the Deutsche Bank Group, he was in charge of MIS Reporting and had to sift through financial data being yielded by computers. From 2002-2007, Ferdie taught Economics courses at Colegio San Juan de Letran, Central Colleges of the Philippines, Assumption College and San Beda College. Among the courses that he taught were Basic Economics, Microeconomics, Macroeconomics, Monetary Economics, Banking Operations, Mathematical Economics and Econometrics with Computer Applications. Although he has since returned to the banking industry, Ferdie did entertain thoughts of teaching Economics courses in some university abroad. Still only in middle age, he has time to fulfil one of his life goals of getting a doctorate in Economics. Who knows? He may yet get to fulfil the dream of teaching abroad. 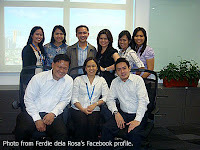 At present, Ferdie is the Manager of the Balayan Branch of the Philippine National Bank. His main responsibility is to solicit deposits from a specific target market. Although he worked for so long in Metro Manila, Balayan was an obvious choice for an assignment. “I chose Balayan because of its accessibility to my parent’s house in Taal,” he says. I must be getting along in years because I do not particularly remember Ferdie as the sporty type when he was in high school. He is, though; and considers himself a fitness fanatic. While most people will simply jog in the morning, go to a gym or play basketball in some open court, Ferdie prefers the bruising world of contact sports. He has been into conventional and muay thai boxing, freestyle and Greco-Roman wrestling, ju jitsu, kali, arnis and knife-fighting. Ferdie has also travelled to Hong Kong and Singapore to participate in dragon boat competitions. “It provides a certain degree of camaraderie,” he says of being part of a dragon boat team. Ferdie is the son of Vicente and Mercedes dela Rosa who continue to live in the historic town of Taal in Batangas. He is brother to Alvin Robert and Rey Thomas. 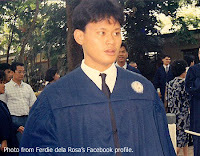 “Still fit at 45,” Ferdie declares on his Facebook profile. Dress him in a suit and he fits the perfect picture of a banker and a learned man, someone who has enriched his knowledge by having worked in various capacities in some distinguished banking institutions and someone who has imparted this knowledge to the young by taking on the noble profession of teaching. Take away the suit and you get a man who has kept his muscles trim, maintained a level of fitness and continues to practice various forms of martial arts. He becomes the picture of discipline and commitment to an art and a sport. He thinks of himself as a ‘man for others’ – an Ateneo motto – which is probably indicative of the excellent work those in the blue side has done on him. His personal philosophy is neither green nor blue, however. ‘Never give up.’ Said simply and a fair reflection of a man who has faced obstacles in life but has always found an inner something from deep within to emerge as the victor. Just as it happens in martial arts; and just as it happens in life for all of us.